The Bledsoe Philippon Post-Op Hip Brace was developed in collaboration with Dr. Marc Philippon, MD, Director of Sports Medicine/Hip Disorders at the University of Pittsburgh. 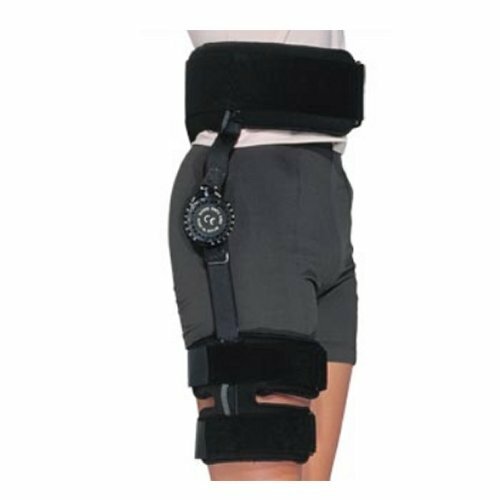 The brace limits hip flexion/extension as well as abduction and adduction in 15 increments from -30 to 105. The brace can also lock in any position from -30 to 60. The post-operative or post-injury brace protects patients following total hip revisions, arthroscopic hip repairs or other hip joint surgeries, injuries or problems that can benefit from range-of-motion control. Can be applied in less than 3 minutes saving valuable time in the operating room. Easily formable aluminum shells covered with a double-thick ultra-breathable polyurethane foam padding with a comfortable loop pile surface. Three simple straps hold it securely affixed to the patient's hip and leg. Indications This device is indicated for post-operative or post-injury use for limited range-of-motion control of hip flexion/ extension; as well as limited abduction and adduction of the hip joint following total hip revisions, arthroscopic hip repairs or other hip joint surgeries, injuries or problems that can benefit from range-of-motion control. Contraindications This device is contraindicated for controlling fractures of the femur or pelvis. Goals Post-Op hip range of motion control. Decrease anti-inflammatory medications. Decrease hip pain symptoms. Improve hip joint recovery. Improve hip surgery success. If you have any questions about this product by Bledsoe Braces, contact us by completing and submitting the form below. If you are looking for a specif part number, please include it with your message.